TYPOLOGY presents Script, Stage, Screen | Ciprian Mureșan, curated by Oana Tanase. Featuring a critical selection of this internationally known artist’s experimental films, Script, Stage, Screen is the first solo exhibition of Mureșan’s work in Toronto, which we are very pleased to present in partnership with the 29th edition of the Images Festival (April 14–23, 2016). 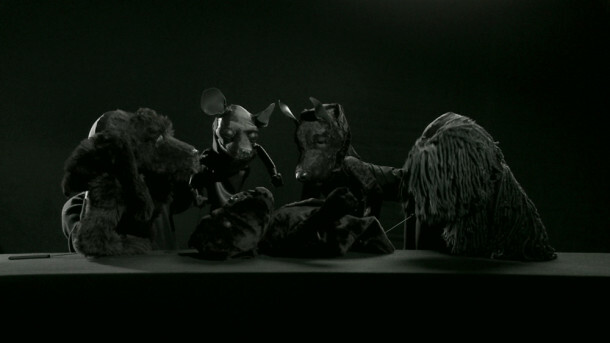 Through the use of puppetry, Mureșan engages performative modes of writing, enacting, and visualizing both the absurd and the whimsical, bringing viewers into surprising and intimate discourse with crucial themes of our times. Whether performing the scripts of influential playwrights such as Saviana Stănescu (Dog Luv, 2009) or generating new texts (I’m Protesting Against Myself, 2011, in collaboration with Gianina Cărbunariu, or Untitled, 2015, with members of the community), Mureșan’s projects speak to ideals of collective intelligence even as they concede the continuing failure of true communality. The audience is challenged not only to reflect upon themes of trust and belief, and the violence that often characterizes interactions between the self, society, and structures of power, but also to imagine a hybrid space in which the ordinary and fantastic can coexist. The films are supplemented with selections from an outstanding list of publications that offer multiple perspectives on Mureșan’s engagement with both the real world and works of others, and with the visual, literal, political and metaphorical discourses these works encompass. 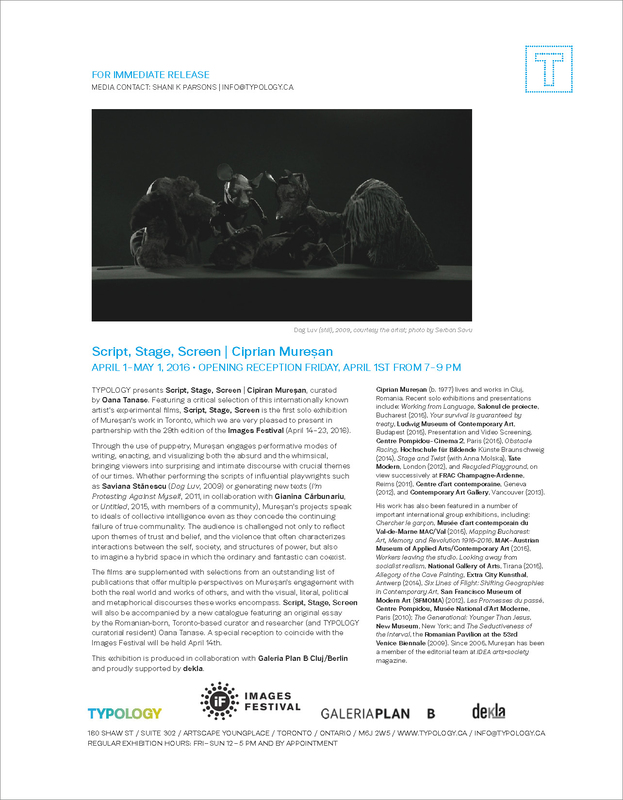 Script, Stage, Screen will also be accompanied by a new catalogue featuring an original essay by the Romanian-born, Toronto-based curator and researcher (and current TYPOLOGY curatorial resident) Oana Tanase. Dates for a catalogue launch and other exhibition-related events will be announced soon. We will have two public receptions for this exhibition! All films are in Romanian with English subtitles. Ciprian Mureșan (b. 1977) lives and works in Cluj, Romania. Recent solo exhibitions and presentations include: Working from Language, Salonul de proiecte, Bucharest (2015), Your survival is guaranteed by treaty, Ludwig Museum of Contemporary Art, Budapest (2015), Presentation and Video Screening, Centre Pompidou – Cinema 2, Paris (2015), Obstacle Racing, Hochschule für Bildende Künste Braunschweig (2014), Stage and Twist (with Anna Molska), Tate Modern, London (2012), and Recycled Playground, on view successively at FRAC Champagne-Ardenne, Reims (2011), Centre d’art contemporaine, Geneva (2012), and Contemporary Art Gallery, Vancouver (2013). His work has also been featured in a number of important international group exhibitions, including: Chercher le garçon, Musée d´art contemporain du Val-de-Marne MAC/Val (2015), Mapping Bucharest: Art, Memory and Revolution 1916–2016, MAK–Austrian Museum of Applied Arts/Contemporary Art (2015), Workers leaving the studio. Looking away from socialist realism, National Gallery of Arts, Tirana (2015), Allegory of the Cave Painting, Extra City Kunsthal, Antwerp (2014), Six Lines of Flight: Shifting Geographies in Contemporary Art, San Francisco Museum of Modern Art (SFMOMA) (2012), Les Promesses du passé, Centre Pompidou, Musée National d´Art Moderne, Paris (2010); The Generational: Younger Than Jesus, New Museum, New York; and The Seductiveness of the Interval, the Romanian Pavilion at the 53rd Venice Biennale (2009). Since 2005, Mureșan has been a member of the editorial team at IDEA arts+society magazine. Oana Tanase is a Toronto-based independent curator and researcher. She holds a MA in Art History and Theory from the National University of Arts in Bucharest, Romania and is currently completing her PhD thesis that aims at discussing documentary practices in contemporary art. Her latest curatorial projects in Toronto include Moving right along | Nicolas Fleming (with Shani K Parsons), TYPOLOGY, Dan Perjovschi: As If All Yesterday’s News Should Be Rehearsed Today For A Better Tomorrow, YYZ Artists’ Outlet; Community (Love) Creates Change (with Denise Moraze), Peter MacKentrick Community Gallery; and Before and After: Celebrating 100 Years of The Barns (with Vid Ingelevics), Artscape Wychwood Barns. Previously, she worked as a curator at the National Museum of Contemporary Art in Bucharest (2006-2012) and as an assistant curator at the Galerie für Zeitgenössische Kunst in Leipzig (2005-2006). This exhibition is presented in partnership with the 29th edition of the Images Festival (April 14–23, 2016). Produced in collaboration with Galeria Plan B Cluj/Berlin and proudly supported by dekla. Not local? Check back for pics from the show and related events, or follow us on Facebook, Twitter, Tumblr, and Instagram for updates and images in your news feeds. And thanks for your continued interest and support.